Over a period of a million years or more, just northwest of today's El Paso, eruptive chaos produced the 600-square-mile Potrillo Volcanic Field. Producing textbook examples of volcanos and lava flows, as well as unusual igneous features such as shield flows and lapilli tuffs, the area attracts vulcanologists from near and far. While driving toward looming volcanic cones through miles of mesquite and yucca, one may suddenly spy the dramatic sight of a 2-mile wide and 400-foot deep pit—Kilbourne Hole. During the last Ice Age, fiercely-hot molten magma forced its way upward into water-saturated sediments. As the water became increasingly hot, it remained confined by the weight of the sediments above, until—heated beyond endurance—it flashed into steam, blasting skyward as much as 500 million cubic yards of earth. 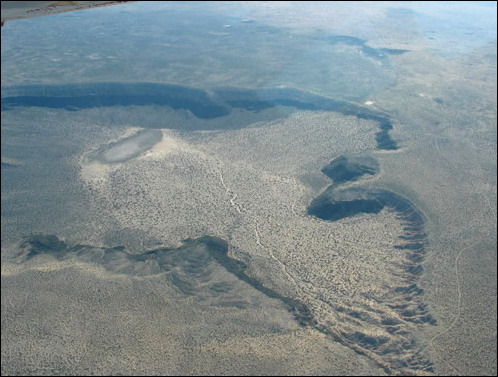 The shallow volcanic craters left are called maars, translating as lakes, because groundwater often covers their floors. Presumably we live only in a lull of volcanic activity—we may yet receive an entirely new concept of steam heating in our northern Chihuahuan Desert. Contributor: Florence E. Schwein, Centennial Museum, University of Texas at El Paso. Desert Diary is a joint production of the Centennial Museum and KTEP National Public Radio at the University of Texas at El Paso. Kilbourne Hole as seen from the air. Photograph courtesy of Aaron Velasco and Jose M. Hurtado, Jr., Dept. of Geological Sciences, University of Texas at El Paso.